String beans are a type of non-starchy vegetable. Low in calories and carbohydrates, non-starchy vegetables make an excellent choice when you are on a diabetes diet. In fact, according to the American Diabetes Association, non-starchy vegetables should make up half of all of your lunch and dinner meals. In terms of serving size, 1 cup of raw non-starchy vegetables is equivalent to 1/2 cup of vegetable juice. One cup of raw green beans contains approximately 31 calories. 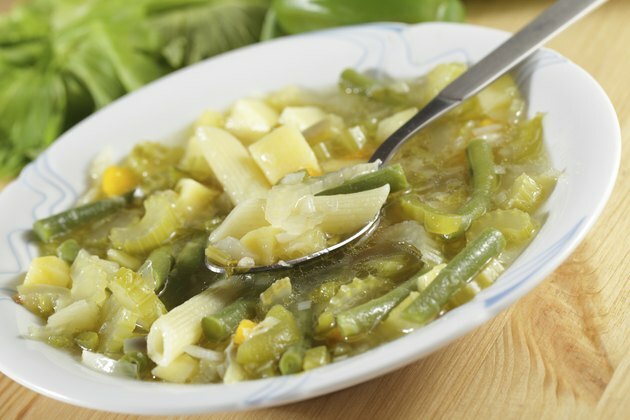 In addition to being low in calories, green beans contain very few carbohydrates. Carbohydrates include sugar, starch and fiber. One cup of raw green beans contains 3.26 g of sugar, 0.88 g of starch, and 2.7 g of fiber. According to the U.S. Department of Health and Human Services, green beans provide an excellent source of the mineral, potassium. One cup supplies 211 mg. The values for 1 cup of raw green beans should apply to 1/2 cup of string bean juice, but may vary slightly depending on your juicing method. A diabetes diet should include at least 3 to 5 servings of non-starchy vegetables per day. According to the American Diabetes Association, drinking vegetable juice is an acceptable way of fulfilling your daily recommended intake of non-starchy vegetables on a diabetes diet. However, keep in mind that the process of juicing tends to raise the glycemic index -- a measure of the effect of foods on your blood glucose levels -- of fruits and vegetables. One reason green bean juice has a higher glycemic index than raw green beans is that most of the fiber found in green beans is lost during the juicing process. A good source of fiber is defined as having more than 2.5 g per serving. One cup of raw green beans contains 2.7 g of fiber, so raw green beans are a good source of fiber. However, the fact that juicing lowers the fiber content of vegetables is a drawback of drinking rather than eating your string beans. According to the American Heart Association, high fiber foods may help promote a healthy body weight, as well as help improve your cholesterol and blood glucose levels. People with diabetes are at an increased risk of developing heart disease. Green beans are an excellent source of potassium. Unlike fiber, potassium and other vitamins and minerals are not diminished during the juicing process. Consuming foods with high levels of potassium, such as green bean juice, may help lower your blood pressure. Since people with diabetes are at an increased risk of suffering from hypertension, it may prove beneficial to incorporate green beans and other high-potassium foods into your diet. Potassium helps to suppress the negative effects of sodium on your blood pressure.